Ideal for commercial recycling use, but perfect for homes as well, this recycling box is constructed of low density polyethylene to hold up under harsh weather conditions and heavy use. The durable plastic will not crack, dent or bow, allowing for outdoor use and storage. The design of this 14 gallon recycling bin allows for easy cleaning, and will prevent liquid and debris build-up over time. The built-in handles make for easy lifting and carrying, while the stackable design allows for use of multiple containers at once, and easy, compact storage. Made from post-consumer recycled resin, this recycling box is environmentally friendly, exceeding EPA Guidelines. The universal recycling symbol clearly imprinted on the side will differentiate this recycling box from regular trash receptacles. 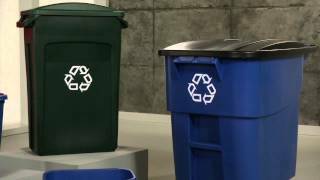 Keep your environment and the planet clean by keeping several of these Rubbermaid Recycling Bins around your home, office, school or church. Stock up today! Dimensions: 21"L x 16"W x 14-3/4"H, 14 gallon capacity.